[Locals speak of] a Matlog, a resident of the mountains, who fills everyone with unspeakable dread. They describe it as having a monstrous body, covered in all manner of rigid black bristles, with a head similar to a human's but with larger, sharper and stronger fangs than a bear's, very long arms, with its fingers and toes armed with long and curved claws. Its screams alone --they say-- can topple anyone... I presume that... members of the tribe received word long ago that these entities owe their existence to demons. Regional Native accounts of Sasquatch encounters by hunters and trackers reflect the contemporary experiences of residents of forested areas that border the giants' mountain domain throughout North America. Encroachment by western civilization has increased levels of interaction between the hairy giants and human beings, as witnessed by many incidents where Sasquatch trespassers have left hair, blood and tissue residue while stealing livestock from country farms at night. Numerous unidentifiable hair samples have been collected from pasture fencing that show distinctly non-human, non-animal characteristics under microscopic examination (above), yet consistently yield human mitochondrial DNA (mtDNA). While this anomalous feature of Sasquatch genetics has halted many forensic investigations, nuclear DNA (nuDNA) studies reveal the giants to be a viable human-hybrid species. For this reason, human-Sasquatch interbreeding produces viable offspring defined as backcrossed hybrids entering the human genepool at a much higher rate than one might guess. 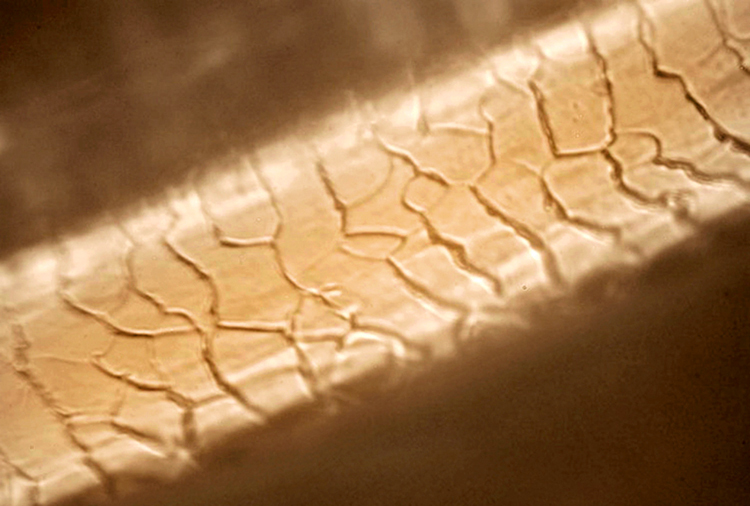 A wide variety of hair shaft profiles were observed using stereomicroscopy and light microscopy (above)... with most exhibiting a stiff, wiry texture and wavy, curved appearance with rounded tapered tips, consistent with aged hairs that had not been cut. The full length of the hairs was approximately 15 cm and diameters ranged from 80 to 110 µm (human head hairs typically range from 55 to 100 µm in diameter). The medulla and root were found to be the two most discriminating characteristics of the microscopic examination. 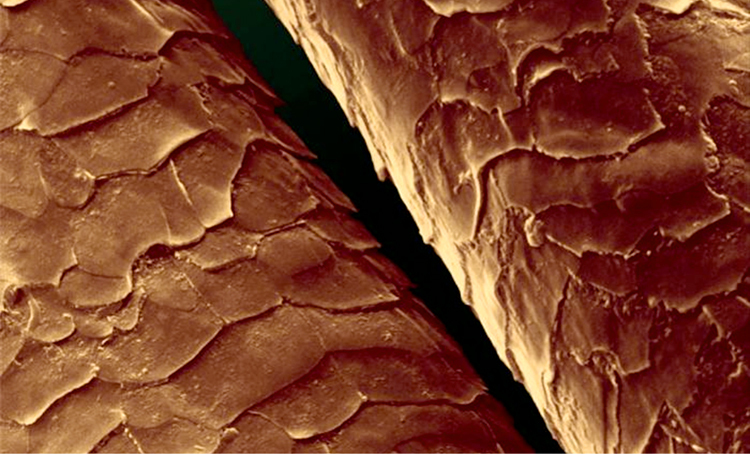 Most of the novel hairs had medullary structures and diameter ratios that were clearly distinct from human hairs... Human hairs exhibit characteristic uniform imbricate scale patterns of the cuticle. Several different cuticle patterns were observed on the submitted samples. The hairs exhibited wide imbricate scale patterns proximally that transformed to close imbricate patterns distally. These patterns are distinctly non-human in appearance. Most of the submitted hairs were not microscopically consistent with any of the hairs from the reference collection of common animal hairs that included human, cat, dog, cow, horse, deer, elk, antelope, moose, sheep, fox, bear, coyote, wolf, rat, mouse, monkey, beaver, squirrel, llama and others. 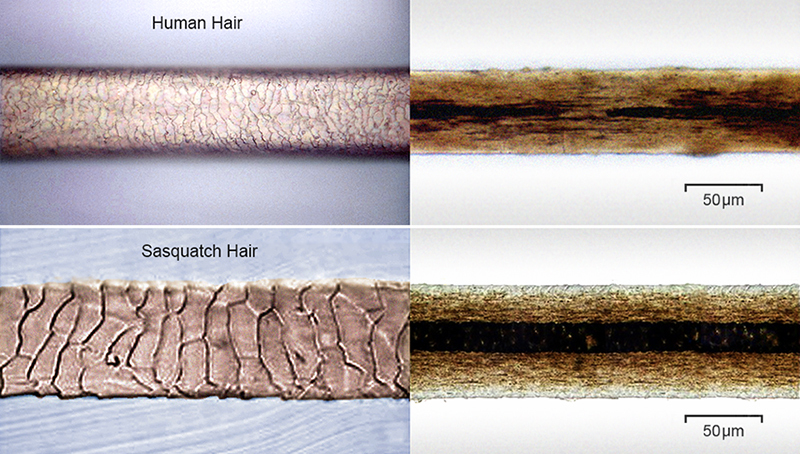 The primate quality of these easily-distinguished Sasquatch hairs is unmistakable, showing imbricate scale patterns and thickness that now form the basis for identification of the giant hybrid. 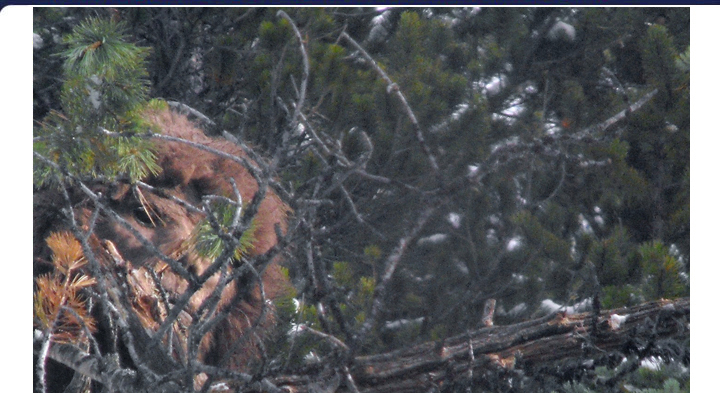 The broad range of colors among Sasquatch hairs includes black, brown, orange, red, auburn, beige, grey and even white, while their skin color ranges from dark grey to light brown. The most impressive sample yet analyzed is a sizable section of skin with beige fur collected from a fresh Sasquatch corpse. The tissue sections reviewed show sufficient preservation for adequate histologic review. The basic epidermal and dermal histological architecture and cellular constituents are intact... It seems there are some abnormalities with abortive hair shafts, various alopecias etc. where hair follicles can be grouped. However, the clustering deeper in the dermis than the level of dermis where most skin appendages usually occur is unusual and is not generally associated with hair follicle loss as is seen with alopecia. This appeared to be hair follicle addition or at least some extra follicles, clustered and deeper in the dermal region. There were also lesser numbers of eccrine glands and even sebaceous gland/pilosebaceous gland units than you usually see in human skin. The relative number of skin appendages is somewhat dependent on which part of the body the skin comes from so that would be location specific. Some surfaces have lots of hair and others considerably more eccrine glands. It is difficult to say where the combination in these sections came from especially since the deeper dermal clustering is not usually found in human skin. Toler's histological analysis was conducted in the blind (without knowledge of the giant human-hybrid origin of the sample), leaving the pathologist apparently unable to reconcile major divergence from normal human skin in a great number of the tissue's structural features. Yet, the overall density, depth and clustering of hair follicles is consistent with the character of protective animal fur, having been especially climate-adapted to the sub-zero conditions of harsh North American winters. 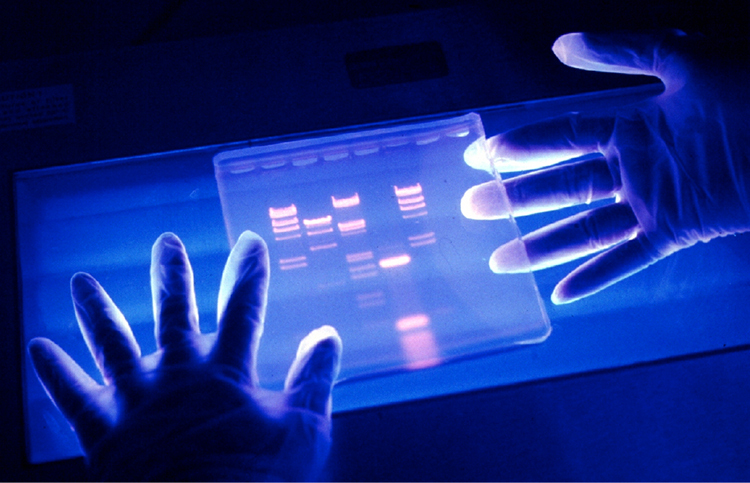 In addition to follicular material from the multitude of non-human, non-animal, unknown primate hairs analyzed, various other biological samples including tissue, blood and saliva were selected for DNA extraction, amplification and sequencing of both mtDNA and nuDNA in an ongoing five-year study by Dr. M. Ketchum and associates at DNA Diagnostics, who have expertly applied strict forensics protocols, supported by blind studies run in parallel at several world-class laboratories in Texas. Of those screened by histological examination, 30 hair samples were selected for mtDNA analysis, whereas hair samples without root material were not recommended for genetic study. The Sasquatch mtDNA analyses revealed a comprehensive set of previously unrecognized anomalies regarding the unusual global distribution pattern of maternal lineages of the giant North American hybrid. Of the 30 distinct individuals sequenced for mtDNA, 20 specimens yielded complete genomes, while 10 yielded partial mtDNA sequences that provided definitive segments enabling haplotype determinations. Surprisingly, all 30 North American Sasquatch individuals yielded fully human mtDNA haplotypes, a majority of which predominate among Europeans, Asians and Africans, while a minority are descended from North American maternal lines. Such consistent human results have been the cause of much confusion among geneticists and Sasquatch field researchers alike, for this unique combination of human mtDNA from distinctly non-human hairs can only be explained by interspecies hybridization. This small sampling of human mtDNA contributors to the Sasquatch species represents 1/3 of all known human haplogroups. Rather than narrowing down the geographic region where hybridization occurred, such a wide distribution pattern denies any specific conclusion regarding the giants' locus of origin. Only 13% of mtDNA haplotypes identified (samples 11, 81, 140 and 168) showed maternal lineages in geographic proximity to their North American habitation sites, yielding Native American haplotype A6L2c, found in greatest concentration among the Inuit and Nivkh peoples; haplotype C, representative of the Evenks and Yakuts; as well as haplotype D, predominant among Aleuts. By contrast, 74% of North American Sasquatch samples sequenced thus far belong to distant human mtDNA haplogroups H and T prevalent among Europeans, and V characteristic of the Arctic Saami. The skin sample with beige fur from Northern California (sample 26) yielded haplotype H1a prevalent among the Basque of the Pyrenees mountains, while black hairs from North Texas (sample 31) yielded mtDNA sequence belonging to the oldest haplogroup, type L0d2a of the South African Khoisan people (below). 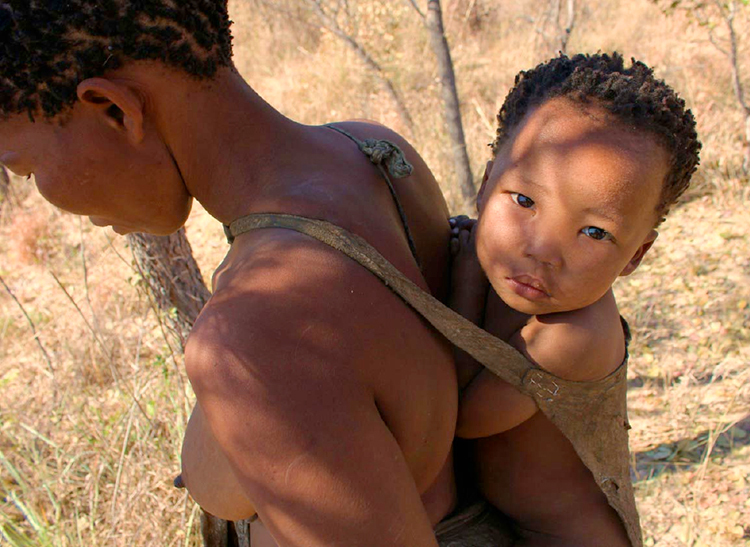 The breadth of diversity of human maternal haplotypes identified among the Sasquatch population follows none of the migratory gene flow patterns common to the great majority of naturally-dispersing populations, instead presenting a series of anomalies that, taken altogether, are highly indicative of a long-term global program of genetic engineering in conjunction with population management. Such strong divergence from natural population dynamics is further compounded by the extreme rarity of specific subsets of mutations among the maternal progenitors of North American Sasquatch. Results from sequencing the hypervariable region of Sasquatch mtDNA have confounded geneticists, in every case presenting sets of mutations at various markers that are unique among modern populations. Notable disparities between human and Sasquatch mtDNA haplogroup T lineages support strong population isolation between terrestrial humans and the female human progenitors of the Sasquatch species. Mutations 146T, 16187C and 16189T are present among all terrestrial humans of haplogroup T, yet none of the haplotype T2 Sasquatch display those mutations. Another anomaly concerns the 73G, 152C, and 263G mutations which appear consistently among the Sasquatch T2 haplotypes sequenced from five different states (OK, TN, WA, AZ, TX), yet are absent in known human sequence belonging to haplogroup T. Instead, among known human populations mutation 73G finds expression among haplogroups X and U. Clearly human, Sasquatch mtDNA haplotypes are indeed distinctive. Further studies may reveal descendants bearing these same distinct sets of mutations, but our present knowledge of genetic diversity among terrestrial human populations refutes the conclusion that the giant human-hybrid Sasquatch is a product of natural species hybridization. The troglodytic lifestyle of the Sasquatch species lends support for the existence of parallel subterranean human populations. The presence of the T2b mtDNA haplotype among the Sasquatch individuals sampled is suggestive of a relatively recent hybridization period for the Sasquatch species prior to the catastrophic events that initiated the warmer Holocene, some 12,000-14,000 years ago. The cometary impacts that ended the last glacial period caused rapid changes in global weather patterns closely associated with significant glacial melt and sea level rise effectively submerging the coastlines of the glacial period by hundreds of feet, leaving behind what is known today as the 'continental shelf'. The recurring cataclysmic loss of spiritual and material knowledge experienced by terrestrial humanity is effectively prevented by the great depth of ancient subterranean populations with advanced technological capabilities. The existence of these technologically advanced human and non-human populations dwelling below the Earth's surface in artificially maintained, illuminated and weather-controlled cavern systems remains largely unknown to most humans now inhabiting the planetary surface, yet the whispers of ancient indigenous wisdom are still audible, echoing within the human collective unconscious. Ethnographers have documented ancient knowledge of subterran cities among Native American cultures, who regard such places as sacred centers where their ancestors survived multiple catastrophes during previous epochal shifts. Underground human populations also account for the distinct genetic material observed of the cave-dwelling Sasquatch maternal lines, apparently derived from an entirely separate human population without any known living terrestrial descendents. The genetic divergence witnessed in the mtDNA mutations of human and Sasquatch haplogroups may relate closely with the segregation of terrestrial humanity from ancient subterran populations caused by cometary bombardment events that ended the Ice Age. These first emerging genetic studies of largely subterranean Sasquatch populations have completely surprised geneticists, however, this previously undetected species has also yielded information concerning a co-existing subterran human population whose ova were used in the advanced genetic engineering of the hybrids, perhaps involving artificial insemination of human females and mid-term fetal removal -as described among alien abduction cases. As genetic sequencing of the North American Sasquatch population continues at a quick pace, a wider variety of samples collected from various continents will reveal genetic relationships between Sasquatch and other such cryptid species of human/primate hybrids, especially the giant Yeti of Siberia, the tiny bipedal 'Orang Pendek' of Malaysia and the man-sized 'Skunk Ape' commonly reported in the Florida everglades. Dr. Ketchum has confirmed that mtDNA sequencing of the Skunk Ape is already underway. In summary, we have extracted, analyzed and sequenced DNA from over one hundred separate samples of hair, tissue, toenail, bark scrapings, saliva and blood obtained from scores of collection sites throughout North America... Analysis of whole genome sequence and analysis of preliminary phylogeny trees from the Sasquatch indicated that the species possesses a novel mosaic pattern of nuclear DNA comprising novel sequences that are related to primates interspersed with sequences that are closely homologous to humans. These data clearly support that these hominins exist as a novel species of primate. The data further suggests that they are human hybrids originating from human females... Though preliminary analysis supports the hybridization hypothesis, ...the data conclusively proves that the Sasquatch exist as an extant hominin and are a direct maternal descendent of modern humans. The Sasquatch Genome Project [obtained consensus nuDNA sequences]... We sequenced three genomes and they aligned... But when we went to look at the nuclear part and started aligning it down chromosomes, we got something... very unusual. It was closely related to human, but it was not human... [-and consistently presented] something that has never been seen before. The genomes aligned with one another, meaning they came from the same species. So, here we've got three independent samples from three different parts of the country from three different submitters and they are all showing the exact same thing on genomes! [The paternal progenitor is] headed a little more towards the lemur line, oddly enough. It is definitely not an ape. And it's interesting that we found out that there is an extinct lemur that weighed 400-500 pounds... [with] opposable thumbs and hooded noses. It really freaked me out that we had lemur. I did not expect that! Phylogeny of Sasquatch nuDNA findings reveals the closest known relative of the giant prosimian paternal progenitor of Sasquatch may be the oversized Megaladapis (above), a giant species often referred to as the koala lemur for their strong anatomical similarities to the undersized Australian marsupial. 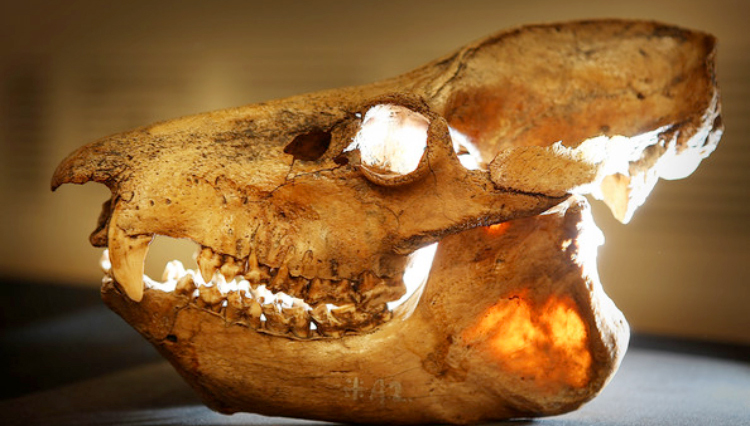 Further research concerning giant lemurs of the Pleistocene period may uncover new species that present closer relationships with the unknown male progenitor of the Sasquatch hybrids. 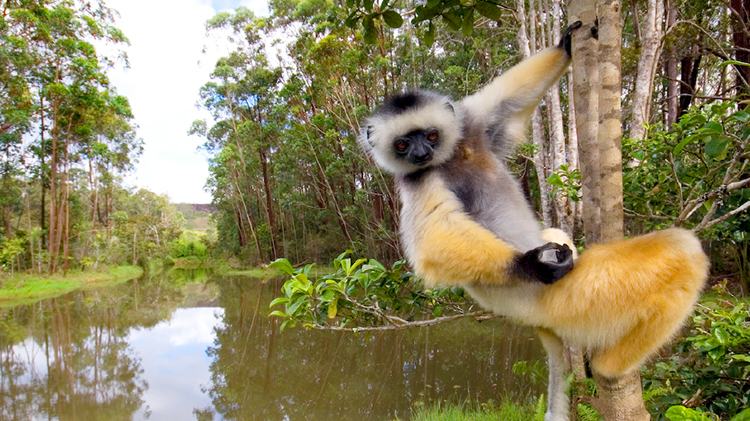 The diademed sifaka is one of the largest prosimians endemic to the forests of Madagascar, known for its black, white and gold coloration, with a fringe of white fur framing its dark face (above). Despite the fact that this contemporary lemur is tiny with respect to its giant Sasquatch 'cousins', the same ruffed fringe of fur encloses the faces of several varieties of North American Sasquatch. The reproductive limitation of size incompatibility must also be considered. An average adult human female stands 5'5" tall, whereas average adult Sasquatch males are 8-9' in height. Such a large height discrepancy suggests the giant prosimian paternal progenitor species may have reached a height of 13'. Even if an awkward mating could somehow be accomplished, how could a human female bring a giant Sasquatch fetus to full term and safely give birth? 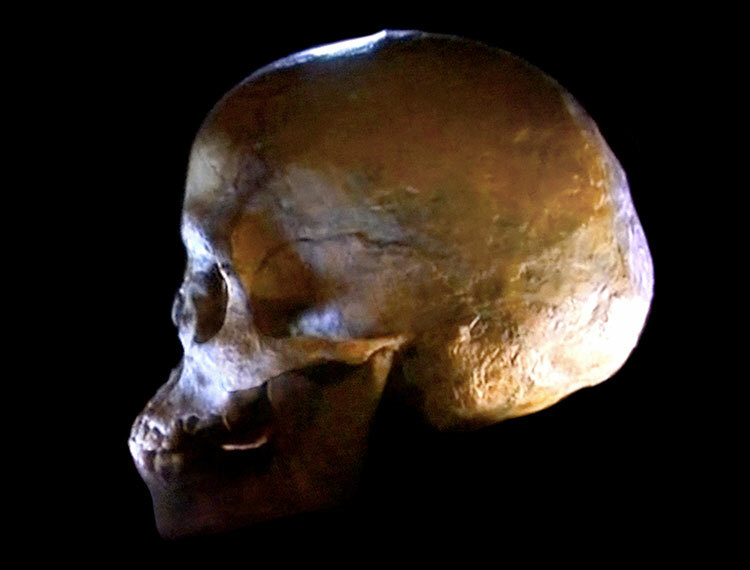 By comparison with the rarity of interbreeding between Neanderthals and modern humans (hominin species of similar size and anatomy) the likelihood of a 13' male prosimian mating with a human female less than half his size seems highly unlikely to ever have happened. That such a mating would occur frequently enough to establish a global population of viable hybrids with the full breadth of mtDNA variation reported by the Ketchum study appears extremely unlikely. Off-ladder alleles and allelic dropout were detected during analysis of short tandem repeats (STRs). The mutations were seen in 16 separate loci when PowerPlex16 amplification was used. X dropout was noted in a significant number of the Sasquatch samples due to novel sequence in the homologous X region of the Y chromosome at the amelogenin locus. This was supported by sequencing this region and the associated novel sequences and failures to sequence at this locus. Novel sequence, failures to sequence and interspersed human sequence was also observed when amelogenin locus exons 1, 2, 4/5 and 8 were sequenced. The same amplification/sequencing patterns were observed at the TAP1 locus. In order to further explore the reasons for the widespread novel amplifications described above, DNA from Sample 26 was imaged using electron microscopy. Electron micrographs of the DNA revealed unusual double strand - single strand - double strand transitions which may have contributed to the failure to amplify during PCR. 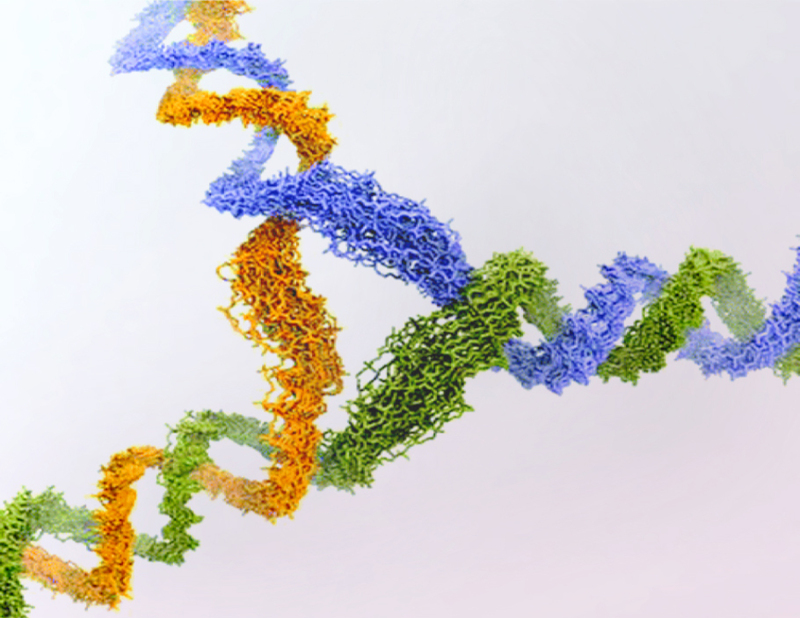 The high quantities of single stranded DNA, interspersed with double stranded DNA... may suggest substantial structural abnormalities of the DNA itself. The DNA was visualized twice by electron microscopy from aliquots of two different extractions from the same sample 26. Both of these extractions not only had yielded successful PCR amplifications previously, but were combined and utilized for whole genome nuclear sequencing at a later time. Alternatively, the abundance of single-stranded loci observed by EM could be interpreted as high numbers of replication forks or another structurally altering genomic process involving an increase in helicase activity. Comparison with genetic sequence from Genbank's over 100,000 distinct, naturally-occurring species reveals unique sequential and structural features of Sasquatch nuDNA that have never been previously observed. The Y-shaped structure of three-way DNA junctions was identified decades ago as a phase of replication involving helicase enzymes (Duckett & Lilley, 1990), yet this configuration was only recently modeled (above; Sabir et al., 2012) and does not normally appear after DNA is amplified. The full scope and significance of the anomalous Sasquatch genome cannot yet be fully grasped by Earthly geneticists, being a technological DNA product that is far in advance of our present capabilities. While not all of the histologically-screened Sasquatch samples presented migration anomalies during electrophoresis procedures, the many difficulties documented by the forensic team at DNA Diagnostics have successfully thwarted all previous laboratory investigations. However, the failure of contemporary DNA sequencing technology to process Sasquatch samples is, in itself, strong evidence of artificial deviation from natural genetic expression as displayed by the great variety of lifeforms on Earth. Both the structural and sequential features of Sasquatch DNA bear the unique hallmarks of advanced genetic engineering and ongoing population management conducted over a period of many thousands of years by a presently unknown consortium, comprised of several genetically-enhanced races of extraterrestrial entities. Each of these distinct humanoid species engages in specific tasks for which they have been especially engineered. According to Native Elders, the Sasquatch species has been artificially created and deployed as Shadow Guardians of subterranean domains. Spanish documentation in 1793 by Jose Mariano Moziño Suárez de Figueroa provided the surprisingly accurate Native account of the origin of the Sasquatch species, noting that "the [Nootka] tribe received word long ago that these entities owe their existence to demons." Contemporary eyewitness accounts involve interaction of Sasquatch with small, luminous aerial spheres, as well as giant aerial discs often occupied by 'demonic entities' -giant reptilian humanoids and the diminutive Grays. The extensive knowledge of indigenous Elders has always been given as warnings to those who are not aware of the malevolent predatory species that stalk human beings during the dark of night. Transdimensional breaches of our terrestrial environment have left trace biological evidence in the form of novel DNA samples, which constitute definitive proof of the advanced artificial manipulation of human genetics by various extraterrestrial species occupying an extensive global network of subterranean bases populated by various human and non-human species. It was not until 1996 that I heard from Peter Khoury about the hair sample that had been recovered from what may have been an alien abduction sexual assault case... By 1998, I began an investigation into the hair sample, when biochemical colleagues agreed to undertake what was the world's first PCR (polymerase chain reaction) DNA profiling of biological material implicated in an alien abduction experience. The analysis confirmed the hair came from someone who was biologically close to normal human genetics, but of an unusual racial type -a rare Chinese Mongoloid type- one of the rarest human lineages known, that lies further from the human mainstream than any other except for African pygmies and aboriginals. There was the strange anomaly of it being blonde to clear instead of black, as would be expected from the Asian type mitochondrial DNA. The study concluded, "The most probable donor of the hair must therefore be as (Khoury) claims: a tall blonde female who does not need much color in her hair or skin, as a form of protection against the sun, perhaps because she does not require it [in a protective environment]..."
This was very puzzling and controversial, until a 'Nature Biotechnology' paper appeared in 2000. It revealed recent findings on hair transplanting with previously incompatible hair, using advanced cloning techniques, developed in a possible cure for baldness. We seem to be seeing similar combined or "grafted" DNA in the sample recovered under controversial circumstances by Peter Khoury back in 1992. Perhaps even more controversial is that we have findings suggestive of nuclear DNA indicating possible viral resistance. The hair sample seems to show it contains 2 deleted genes for CCR5 protein and no intact gene for normal undeleted CCR5 -this CCR5 deletion factor has been implicated in AIDS resistance. To keep a very complex story somewhat uncomplicated, what seems to be suggested by the range of findings is possible evidence for advanced DNA techniques and DNA anomalies and findings, for which we are only now discovering or starting to make sense of in mainstream biotechnology. Fifteen years after this exceptional early DNA study was conducted, next generation whole genome sequencing of nuDNA from the extraterrestrial blonde hair sample has not been published. As with the hybrid Sasquatch case, fully human mtDNA results obtained from the blonde hair do not correspond to Khoury's description of the decisively non-human proportions of the face and body of the naked female who assaulted him. This obvious discrepancy was largely dismissed, yet suggests the very tall blonde is not only a product of advanced hair grafting and CCR5 genetic enhancement, but that she is also a human-hybrid whose nuDNA contains segments of novel sequence that are extraterrestrial in origin. The location of Khoury's home, where the assault and subsequent hair discovery occurred, is another significant factor that has been overlooked. Sydney, Australia (33.88°S 151.21°E) is 8,962 miles from the Great Pyramid in Egypt, a distance that is 36.0% of the Earth's mean circumference. Infrasound waves focused onto the area where Khoury resides caused repeating spates of loud explosions and strong rattling of houses on August 7-8, 2007. The disturbing events were reported to local police by hundreds of area residents and followed-up with dismissive spin coverage by local news media. The powerful infrasound rattling of August 7-8, 2007 appeared simultaneously with a gigantic Doppler radar anomaly, presenting two counter-rotating spiral features centered over Melbourne that spanned outward over 500 miles in every direction, covering a vast circular area that extends within 80 miles of Sydney (above). Melbourne (37.87°S 145.53°E) shows an exact 35.0% distance from Giza. Similar giant circular areas of anomalous water vapor activity have also appeared on Doppler radar observations centered above the coastal city of Brisbane on February 4, 2010, and again to the north above the town of Gympie on April 2, 2010, in an area made famous for the discovery of an ancient pyramid. The Gympie pyramid site has yielded many Sanskrit artifacts that suggest an Atlantean origin, yet went unrecognized by authorities and was recently destroyed for a bypass road in 2009. Further radar anomalies, similar in both shape, size and often including a single spiraling feature, were also recorded directly centered above Sydney on February 25, 2010; June 22 and November 9, 2011; and again on January 8 and May 16, 2012. An extreme incident related to these anomalies occurred in Sydney on June 24, 2011, when spontaneous piezoelectric fire destroyed an unoccupied home, induced by covert infrasound emissions from radar installations in resonant alignment. 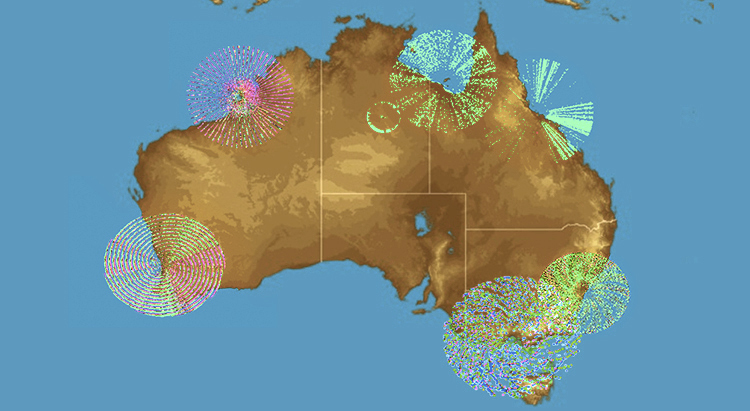 The well-defined global distribution pattern of ancient pyramids and sacred sites has been employed for covert atmospheric manipulation systems within Australia's radar network, having become evident in the last several years of intensified tampering with nature's forces. Severe weather, tornadoes and waterspout formations in Australia are being generated by increased output from this array of secretly weaponized radar systems. The same technology induced deadly tornadoes across Europe in 2012. The focused confluence of so-called 'paranormal' activities involving UFO sightings, human-hybrid encounters, spontaneous piezoelectric combustion and radar anomalies at exact whole number percent distances from the Great Pyramid cannot be understated. 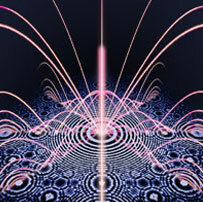 The many remarkable geometric alignments defined by these astounding patterns in space and time reveal the fundamental influence of infrasound resonance -an almost imperceptible cosmic force that binds the dimensions. Regional mapping of Sasquatch activity patterns in North America also supports this complex hypothesis. 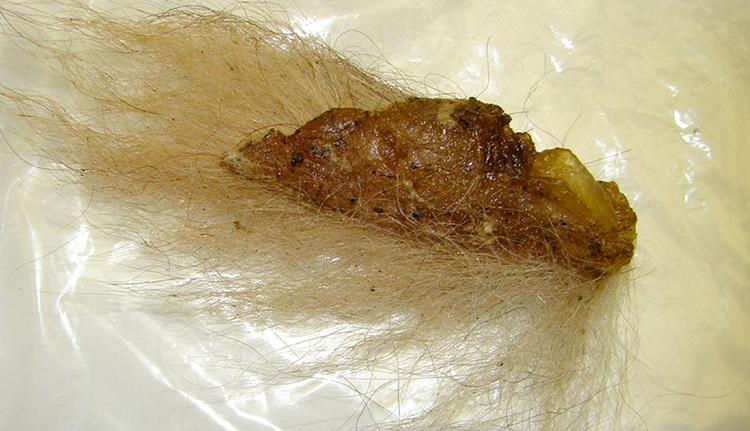 The Sasquatch Genome Project confirmed the novelty of hair root samples collected in thickly forested areas of London, Putnam, Overton and Clay counties in eastern Tennessee. The indigenous Cherokee tribe once protected a sacred 4.5-acre subterranean lake now called the Lost Sea, within Craighead Caverns. The lake's pure waters are the result of filtration through piezoelectric calcite of the limestone bedrock, becoming intensely ionized by focused infrasound standing waves that converge on the area. Nearby Knoxville, Tennessee (36.01°N 83.94°W) lies exactly 6,244 miles from Giza, which comprises 25.0% of the Earth's mean circumference distance -exactly one quarter (circled in red, below). Infrasound resonance in this area is responsible for earthquake-like tremors experienced in West Knoxville on May 14, 2007, which accompanied the formation of an intricate crop circle mandala in nearby Madisonville on the very same night. Another crop formation event took place on May 11, 2011, rendering the octagonal refraction pattern of calcite, the main constituent of the local bedrock. Further along this 25.0% alignment to the northwest, infrasonic levitation of large sandstone boulders has also been documented in multiple locations in Indiana's Limon and Yellowwood State Parks. In Colorado I succeeded one day in precipitating a dense fog. There was a mist outside, but when I turned on the current the [water vapour] cloud in the laboratory became so dense that when the hand was held only a few inches from the face it could not be seen. Colorado Springs (38.92°N 104.82°W) is located 6,861 miles from the Great Pyramid. This distance comprises 27.56% of the Earth's mean circumference, or 55/200 when expressed as a fraction. Infrasonic induction of intense piezoelectric heating was measured by investigators at 800°F after a small boy suffered burns when his shoes melted on a Rockrimmon neighborhood playground on June 3, 2008. Relative geopositioning of all of these infrasound-related incidents reveals resonant distance intervals.